When it comes time to showcase your skills or product/service on your WordPress site through video, you will need to use a plugin designed to support your video media or content. Lucky for you, there are quite a few options available to get your videos uploaded and display a glowing video gallery. Envira is by far the best WordPress video gallery plugin and is super easy to install on your site. This plugin allows you to create and compile a video gallery at the touch of a button and comes equipped with easy to use drop and drag widgets that help get the job done. This plugin allows you to create galleries form Youtube, Vimeo, Wistia and self-hosted WordPress videos. The name is a giveaway if you are wondering how difficult it is to use this plugin. This amazing plugin automatically uses custom post types to add, organize and even categorize your videos with the click of a button. The YouTube Simple Gallery short code is used to create a listed video gallery which can be edited and formatted to change the overall appearance of the video gallery list. This is another easy to use plugin which offers some of the same features as the Simple Gallery. The main difference of this plugin is the overall beauty of the gallery layout and there are also additional drop and drag widgets available to make the process easier. This WordPress Video Gallery Plug boasts all of the same functionality as the Simple Gallery but looks much better from a design point of view. If HD is your thing then this plugin is a must. WordPress Video Gallery offers High Definition video play and the skins are highly customisable. This plugin also offers you the option of seeing what your videos will look like and all of the features can be changed before going live with your gallery. This plugin is a must for large video files that must be seen in HD. This plugin works on a much more basic level in comparison to other video gallery plugins and is compatible with Vimeo, YouTube, and Wista. 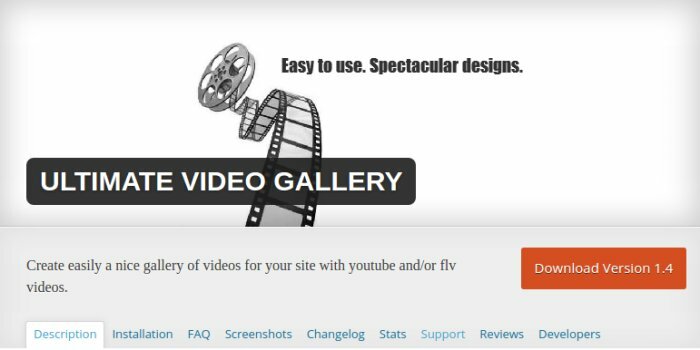 This plugin uses a simple user interface to add URL’s of the videos that you want to use and will create your gallery based on these videos. This plugin also lets you create multiple galleries with different sets of videos so you can create different subject based video galleries. 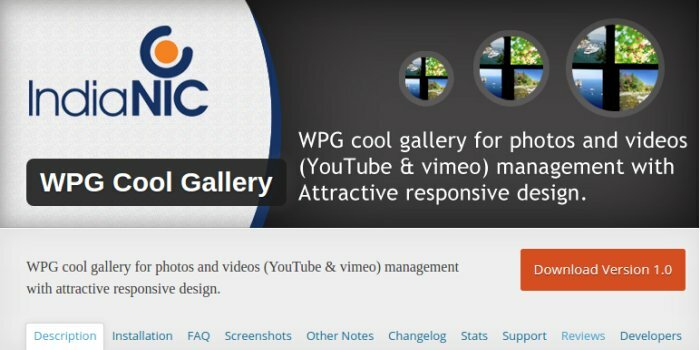 WPG Cool Gallery is a simple to use plugin that allows you to upload and display videos into an easily navigated frame and gives your viewers the option of seeing your gallery all on one page or individually through a pop-up window. This plugin works with YouTube and Vimeo to display a fully responsive galley. This easy to use plugin benefits from the ability to create endless galleries to upload and uses short code to create and manage the video gallery. This plugin uses a very simple design interface to load the videos straight from the source and all of the features are customisable if you wish. Any of these options would make an amazing addition to your WordPress site and these galleries are sure to showcase your skills or media in a mind-blowing way and can be done quickly and easily. If you have been searching for Google Analytics plugins to boost business and drive traffic, read on. There are many exciting and highly-proficient GA plugins for WordPress on the market that will help you get a deeper insight into the behavior of your site visitors and help you cater for them more effectively. Google Analytics was launched in 2005 after Google purchased Urchin. It is now one of the most popular web analytics services around. Features of GA include various data visualisation tools including scorecards, motion charts and a dashboard. You can use the platform to view and assess changes in data and behaviour over time. It also offers segmentation for analysis of subsets like conversions and provides you with valuable custom reports alongside e-mail based sharing and communication. The platform integrates with various other Google products such as AdWords. The tool is targeted towards small and medium-sized sites, particularly retail websites. Let’s take a look at some of the very best Google Analytics plugins for WordPress right now. The process of adding Google Analytics to your WordPress site is quick and easy with Analytics Cat. The plugin doesn’t feature an array of unnecessary features and enables you to add your GA code to your site in under two minutes, without the site being slowed down. All you have to do to get started is install and activate the plugin, copy and paste the GA info and you’re ready to get started. The plugin works straight out of the box, and there is a useful quick-start guide to make the whole process wonderfully uncomplicated. What’s also great is that the plugin is totally free (we actually use this plugin our site). Google Analytics by MonsterInsights was once known as Google Analytics by Yoast. Free and paid-for versions are available, and the installation process is simple. Once you have configured the plugin, you’ll be able to track visitors, download numbers and click on outbound links. The intuitive plugin features tool that users can get to grips with quickly. You won’t need to open any other site to access analytical data after the plugin is installed, as everything you require can be seen on the dashboard. The plug in also uses lightweight code that doesn’t put vast amounts of pressure on the server. There are demographic and interest-based filters to take advantage of. Many users begin with the free version before graduating to the paid-for one. Also easy to get to grips with is WP Statistics. This plug in works flawlessly with a host of search engines including not only Google but Bing, Yahoo and many more. Visits are tracked based on GeoIP, and hashing IP addresses in the database are supported, protecting user privacy. The plugin can also track e-mail stats and place them in reports. You can export XML, TSV and CSV file data with the plug in, which is renowned for the quality and number of its export options. If you regularly need to produce reports to gain access to valuable information about user behaviour, WP Statistics could well be the perfect match for your needs. Web Dorado’s Google Analytics WD integrates Google Analytics into your site impressively, and there are many useful features to take advantage of, including stats overviews, traffic information, analytics reporting and more. The plugin is pleasingly responsive and has what it takes to give you a real edge over the competition. Free and premium versions are available. If you do find the free version to be somewhat restricted, you can opt for various Pro packages that rise in price depending on the features you require. The Pro plans unlock various features such as ecommerce tracking, pushover notifications, AdWords reports and full GA reporting to name but a few. WP Power Stats works independently and has no connection with GA. It has built-in options that let you track visitors and generate reports based on a number of elements. Filters can be used to obtain greater analysis, and nine languages are supported. The plug in tells you about page views, unique views, devices used for viewing, browsers used, traffic sources, search terms, the geographical locations of visitors, operation systems and referrers details. This simple but valuable and reliable plugin only has a modest number of features, yet each one it does offer is incredibly useful. The plugin gives you an excellent insight into the activity happening around your site and supports IPv4 and IPv6 connections. It has an uncluttered analytic meter and can give you information about landing page performance, unique visitors, returning visitors, page views and stats based on geographical locations, screen resolution and more. The plugin app can prove very helpful if you’re running multiple blogs. The Google Analytics Dashboard for WP may be perfect for you if funds are limited. The powerful plugin is available for free and has a popular live stats function that appears on each page or post. One limitation of the plugin is that you’re likely to get more use out of it as an advanced user, however it retains a vast host of valuable features, such as enabling you to add your own GA tracking code and show stats in the WP dashboard. This unfussy, popular plugin provides you with a detailed breakdown of post stats on the back and frontends. Rather than having to work your way through various individual sections of Google Analytics, you can see everything you need on a single page. There are increasing numbers of add-ons being prepared for the plugin, such as a feature that will allow you to track Woo Commerce and Easy Digital Downloads activity. We hope you found our guide to the best Google Analytics plugins for WordPress useful. Hopefully, you’ll find something in the above list that meets your needs, preferences and budget perfectly.